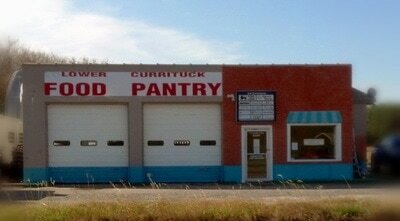 Below are old photos (old camera quality) that share the early history of the Lower Currituck Food Drop. Farther down this page are images of the Lower Currituck Food Pantry when located in the remodeled gas station. You may also enjoy viewing: Historical Newspaper Articles ​on the LCFP. ​ The Lower Currituck Food Pantry initially began in 2008 as the "Lower Currituck Food Drop" through the visioning of two area pastors: Pastor David Blackman and Pastor David Coxson. 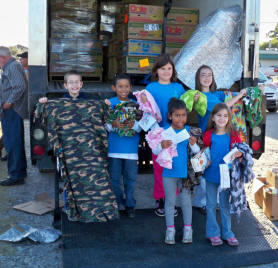 Several locations for the food truck deliveries were visited through Lower Currituck. The first food drops were initially located at Jarvisburg Elementary School parking lot and the Dr. W. T. Griggs Elementary School gym but soon became established at the Hardees parking lot in Grandy, North Carolina. 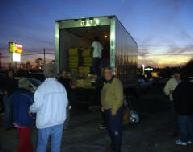 As food drop recipients and volunteers increased, and by the generous support by many area pastors with their respective churches plus sponsorship by organizations and individuals, the Lower Currituck Food Drop eventually became established in a remodeled gas station as the "Lower Currituck Food Pantry." The new location was dedicated in 2010. View the Lower Currituck Food Pantry Album below for more historical photos. All photos on this website are courtesy of S. Grandy. Please inquire for permission to publish. Thank you.